COLOGNE, Germany, September 26, 2018	(Newswire.com) - 4Stop (“FourStop GmbH”), a leading global provider for KYC, compliance and fraud prevention announces today that they have been reviewed and listed as a top 10 most trusted ERM solution provider of 2018 by Insight Success. Insight Success constantly has their pulse on various industries, market trends, newfangled business solutions and the latest technology advancements, firmly focused on organizations of all sizes and sectors thriving in the business world. Providing critical information and research reports required for businesses to stay abreast of their industry news, solutions and technology available to them. “Upon review of the nominees listed in The 10 Most Trusted ERM Solution Providers, 2018, with consideration of aspects such as prolificacy in the application and delivery of all-encompassed risk management solutions and services, and an ambitious global ascension, 4Stop featuring as the Company of the Year has excelled pertaining to developing its complete risk management solutions for performance improvement of its clients,” asserts the Editor-in-Chief of Insights Success Magazine, Pooja M. Bansal. 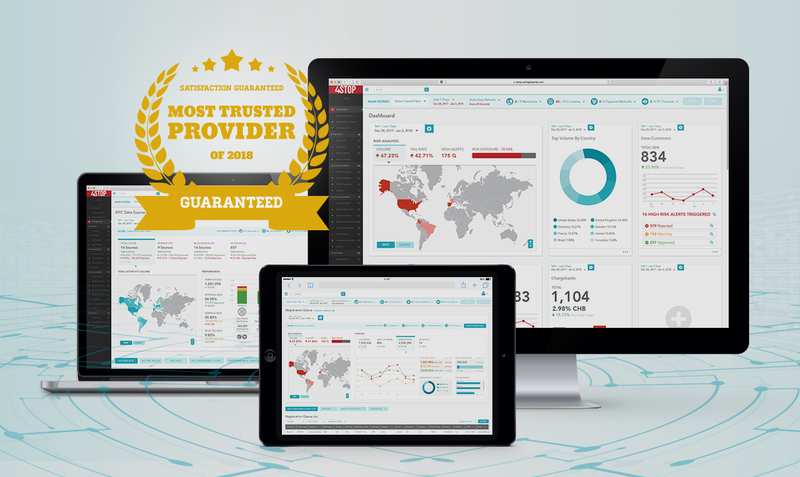 From a single API, 4Stop brings together trusted information, managed services, technology and expertise that empowers businesses to make quantifiable decisions to confidently manage their risk-based approach in real-time and accelerate their business performance. Designed in a manner that not only supports today's KYC, compliance and fraud prevention requirements but will continually manage these requirements in the most efficient and simplistic manner as our global regulatory landscape and online engagement evolves. Collectively the founders of 4Stop have over 60 years’ experience in the risk management industry, resulting in a thorough understanding of global risk mitigation needs within various markets online. Risk management is their passion and they designed their product to not only exceed worldwide KYC, compliance and fraud prevention needs but to deliver on these requirements from a single all-in-one solution with real-time functionality and results. To learn more about 4Stop, please email sales@4stop.com or visit www.4stop.com.